“Our investigations show that many extratropical volcanic eruptions in the past 1,250 years have caused pronounced surface cooling over the Northern Hemisphere, and in fact, extratropical eruptions are actually more efficient than tropical eruptions in terms of the amount of hemispheric cooling in relation to the amount of sulfur emitted by the eruptions,” says Dr. Matthew Toohey from GEOMAR, first author of the current study. Large-scale cooling after volcanic eruptions occurs when volcanoes inject large quantities of sulfur gases into the stratosphere, a layer of the atmosphere that starts at about 10 to 15 kilometers height. There, the sulfur gases produce a sulfuric aerosol haze that persists for months or years. The aerosols reflect a portion of incoming solar radiation, which can no longer reach the lower layers of the atmosphere and the Earth’s surface. The study goes on to show the importance of injection height within the stratosphere on the climate impact of extratropical eruptions. “Injections into the lowermost extratropical stratosphere lead to short-lived aerosol, while those with stratospheric heights similar to Pinatubo and the other large tropical eruptions can lead to aerosol lifetimes roughly similar to the tropical eruptions,” says co-author Prof. Dr. Kirstin Krüger from the University of Oslo. The results of this study will help researchers to better quantify the degree to which volcanic eruptions have impacted past climate variability. It also suggests that future climate will be affected by explosive extratropical eruptions. 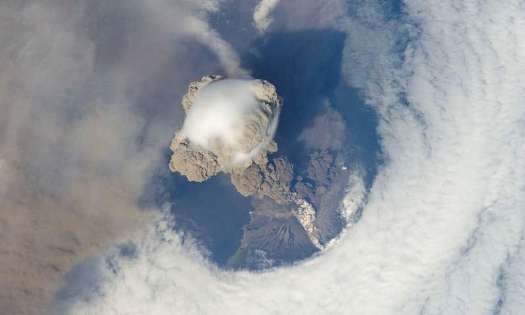 “There have been relatively few large explosive eruptions recorded in the extratropics compared to the tropics in recent centuries, but they definitely do happen,” says Dr. Toohey. The strongest Northern Hemisphere cooling episode of the past 2500 years was initiated by an extratropical eruption in 536 CE. This new study explains how the 536 CE eruption could have produced such strong cooling.